In addition to our desktop and mobile apps, we make reclaiming your online privacy, security and freedom easy. It's as simple as selecting Connect on your Android TV devices. 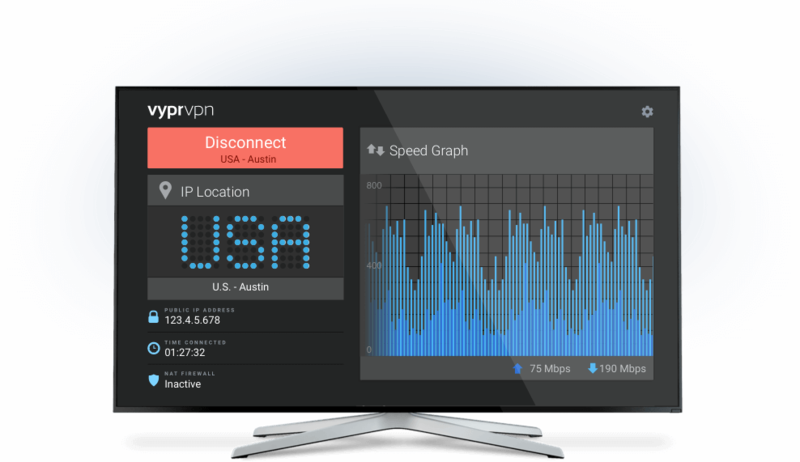 Use VyprVPN with your smart TV to improve your streaming speeds, access geo-blocked content and maintain security while streaming online. The VyprVPN for Android TV app has several different features to help you customize your experience. Customize VyprVPN to automatically connect whenever you need it when using your Android TV device. Monitor your connection speed and view your upload or download speeds with VyprVPN enabled or disabled. VyprVPN for Android makes it fast and convenient to switch between all of VyprVPN's 70+ worldwide server locations. Manually or automatically scan for open ports to get more consistent and successful VyprVPN connections. Set up on your Android TV device is easy. Golden Frog users can start by downloading our TV-compatible APK and following these setup instructions.